Sitwell’s poem stands as a testament to nothing if not the simple fact that the London Blitz drove the creative energies of innumerable poets, artists, and thinkers, from T.S. Elliot to Benjamin Britten. As Michal Shapira compellingly demonstrates in her new book The War Inside, the specter of conflict on British soil also had profound implications for the practical application and theoretical formulation of psychoanalysis as a burgeoning medical and philosophical enterprise. In Chapter 1, Shapira demonstrates how a new social concept of anxiety related to warfare—one that encompassed the civilian population as much as it did military personnel—arose during World War II. Focusing on the British Psycho-Analytical Society (BPAS) and the work of Anna Freud, Chapter 2 links this reconceptualization of anxiety to the work of child psychoanalysts: because the war fractured families and separated many children from their parents, analysts reasoned that the surest avenue to a functioning democratic society involved the restoration of familial relationships and the quelling of internal anxieties. Where Chapter 2 outlines the clinical work of Anna Freud, Chapter 3 examines the psychoanalytic contributions of Melanie Klein, exploring the extent to which Klein placed further emphasis on the inner psychological conflicts precipitated by total war. Chapter 4 describes how psychoanalytic expertise was disseminated at the broad level of radio broadcasting rather than the narrow level of the individual clinic. While the bulk of Shapira’s book concentrates on the everyday problems of normal families and children, Chapters 5 and 6 instead focus on the Institute for the Scientific Treatment of Delinquency (ISTD), a dynamically-inclined organization that made important contributions to the field of criminology, in order to track the rise of the “therapeutic state” (196). Finally, in Chapter 7, Shapira uses John Bowlby’s pioneering work on the mother-child relationship at the Separation Research Unit as a window into the influence of psychoanalysis on social policy and hospital regulations. As much as The War Inside deals nominally with “psychoanalysis,” Shapira is too careful a scholar to treat psychoanalysis as a unified and monolithic enterprise. Indeed, among the book’s most significant strengths is the way in which it not only isolates the various strains of psychoanalytic thought and practice, but also identifies the various points of disjuncture and continuity among these different strains. Shapira, for instance, brings nuance to a longstanding conversation in the history of psychoanalysis surrounding Anna Freud and Melanie Klein’s competing visions for psychoanalysis. Without trivializing the critical differences between Freud and Klein, Shapira astutely sheds light on the spaces of overlap and dialogue between these two schools of psychoanalytic thought: “A historical reading of these two women’s archival and published war work,” Shapira writes, “reveals that they were more similar than they first appeared. They both emphasized anxiety, aggression, and the fragility of selfhood, and the social as well as personal need to acknowledge and work through such emotions” (89). Beyond clarifications of this nature, the book’s most substantial contributions hang loosely together into two categories: the book offers insights into both the conceptual reformulations of psychoanalysis during and after World War II and, more interestingly, the processes by which analysts integrated these new psychoanalytic concepts within the actual policies and practices of the British state. The key conceptual insights, which extend previous historical scholarship on psychoanalysis in its domestic and civil contexts, involve the ways in which British analysts shifted their focus from the externalities of conflict—the body counts, the evacuations, the incendiaries—to its internal manifestations. The conceptual establishment of a representational “war inside” that paralleled the tangible “war outside” designated the British citizenry, alongside the British military, a key site of therapeutic intervention. It was at these new sites—the minds, the homes, and the families of British citizens—that psychoanalysis sought to promote a harmonious and, above all, democratic society. Psychoanalysis helped in braiding together the personal and domestic lives of citizens and a broader democratic ideology. These notions, however, did not merely exist in a psychoanalytic echo chamber. While developed through psychoanalysis, ideas about democratic selfhood and a “war inside” were enacted in various facets of British society. 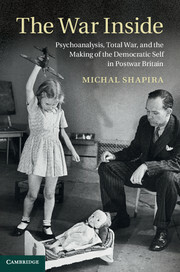 Shapira’s book, then, also unpacks the processes by which psychoanalytic concepts were transmuted into social realities: these ideas were broadcast by Donald Winnicott and the BBC, codified into legal systems and disciplinary policies through the work of the ISTD, and introduced into nurseries and treatment centers by individual analysts like Anna Freud. In short, imaginatively conceived and sharply written, The War Inside sits at the interface of the private and the public, showing how among the most intimate spaces of human existence—the psychological self—dynamically interacted with spaces of broad social concern. Psychoanalysis, Shapira shows us, was a central catalyst of this interaction. Those interested in the history of psychoanalytic ideas—their formation, their dissemination, and their social implementation—will find much intellectual nourishment in this highly original book. Andrew Lea is a graduate student in the History of Science, Medicine, and Technology at the University of Oxford. Shapira, Michal. 2013. The War Inside: Psychoanalysis, Total War, and the Making of the Democratic Self in Postwar Britain. Cambridge: Cambridge University Press. Sitwell, Edith. 1985. “Still Falls the Rain.” In Peter Levi (ed. ), The Penguin Book of English Christian Verse. Harmondsworth: Penguin Press. Zoë Wool's "After War: The Weight of Life At Walter Reed"
Lea A. Michal Shapira’s The War Inside. Somatosphere. 2015. Available at: http://somatosphere.net/2015/michal-shapiras-the-war-inside.html/. Accessed April 26, 2019. Lea, Andrew. 2015. Michal Shapira’s The War Inside. Somatosphere. http://somatosphere.net/2015/michal-shapiras-the-war-inside.html/ (accessed April 26, 2019).